Celebrate the festival of lights for all eight nights with a Texas twist. While the oil burns for eight days, it’s no mystery that fried food, meaty meals and sweet delicacies take the stage for Hanukkah, which begins this year at sunset Dec. 24. To unearth the best recipes in classic Jewish cuisine, Austin Woman went straight to Amy Kritzer, the River City’s resident Jewish-food expert and the blogger behind What Jew Wanna Eat. Kritzer’s recommendation: With a little bourbon, a lot of deep frying and lick or two of dulce deleche, try these three traditional turned Texan dishes before singing “Maoz Tzur” each night. 1. Preheat the oven to 350 degrees. Grease two six-cavity doughnut pans. In a large bowl, whisk the flour, baking powder and 1/4 teaspoon salt. 2. In a separate bowl, whisk the eggs with butter, then add 3/4 cup brown sugar, 1/4 cup dulce de leche, 1/2 cup whole milk and 2 teaspoons vanilla, and whisk until smooth. Then whisk the wet and dry ingredients together until the mixture is smooth and there are no lumps. 3. Spoon the batter into the pan, filling cavities about three-fourths full. Bake for 16 minutes, or until a toothpick comes out clean. Let them cool slightly. 4. Meanwhile, make the glaze by melting the brown sugar with 6 tablespoons butter and 1/2 teaspoon kosher salt over medium heat. 5. Add 1/4 cup dulce de leche, 1/4 cup milk, corn syrup and 1 teaspoon vanilla. Stir and bring to a boil for three minutes. Add powdered sugar and stir until well combined. 6. Dip each doughnut into the glaze, covering the top. Let them cool on a wire rack over parchment paper to catch any drips. Let the glaze set before serving. 1. Whisk together two eggs with 1 tablespoon vegetable oil. Add the matzo ball mix and 2 tablespoons of chives, and stir until combined. Let the mixture chill in the refrigerator for 10 minutes. 2. Meanwhile, bring 10 cups of salted water to a boil. 3. Wet your hands and roll the mix into 12 to 14 evenly sized balls. 4. Boil the matzo balls for 15 minutes, until they have expanded, stirring and turning them occasionally. 5. Set the balls aside and let them cool slightly, until they’re cool enough to handle. 6. Whisk together the mayonnaise, hot sauce and citrus. 7. Make three bowls: one with flour seasoned with salt and pepper, one with two whisked eggs and one with panko. 8. Dust the balls in flour, then dip them in the eggs and finish by rolling them in panko. 9. Heat 3 inches of vegetable oil to 350 degrees. Gently place the balls in batches into the pot and fry three to five minutes each, until golden brown, turning occasionally. 10. Set them on a rack to cool. 11. Serve them hot with a side of dip and garnished with additional chives. 1. Make the rub by mixing the kosher salt, black pepper, smoked paprika, fennel, cinnamon and espresso. Rub it all over the brisket and let it sit wrapped for two to 24 hours. 2. Once you are ready to cook, let the brisket come to room temperature by sitting out for 30 to 60 minutes. 3. Heat the oil in a heavy-bottom pot or Dutch oven. Put the brisket fatty side down and cook without moving it for five to seven minutes, until the fat is rendered. Turn the brisket and cook for an additional three minutes. 4. Remove the brisket and set aside. Add the celery, carrots, garlic and onion to the pot and saute for about five minutes, until the mixture is golden brown, making sure to scrape up any bits on the bottom of the pot. 5. Add the tomato paste and stir an additional two minutes. Add the brisket back in and add the bourbon, brown sugar and apple cider vinegar. Bring to a boil, cover and let it simmer over medium-low heat for three and a half to four and a half hours. 6. Pour the liquid over the brisket occasionally during this process. 7. When it’s ready, transfer the brisket to a large plate or cutting board, fatty side up and let it rest 30 minutes. 8. Meanwhile, remove any solids from the brisket sauce and discard. Add the cranberries and bourbon to the pot and cook for 20 minutes, until the cranberries have popped and the sauce has thickened slightly. 9. 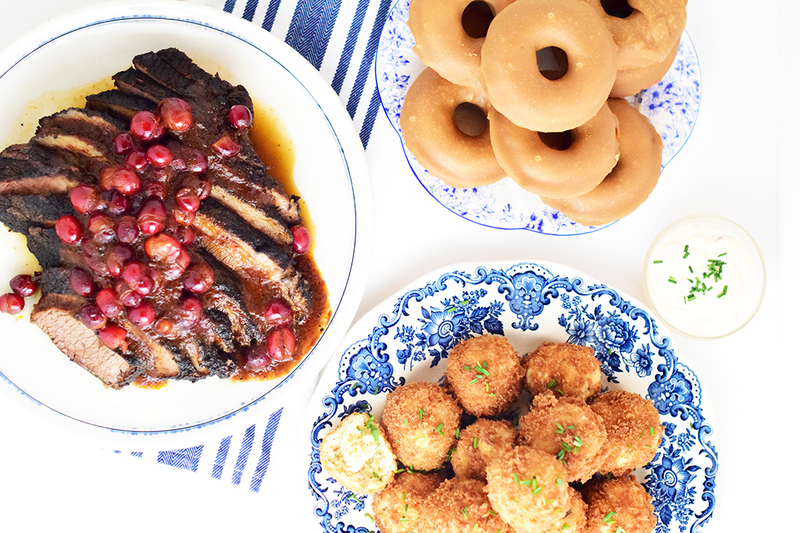 Slice the brisket against the grain and top it with the bourbon cranberry sauce.